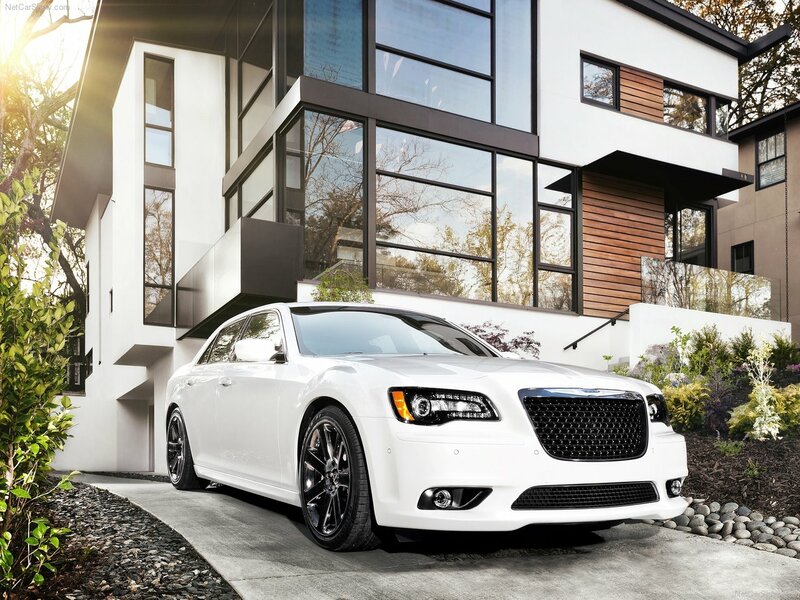 The 2012 Chrysler 300 SRT8® adds high-performance hardware to the elegant proportions and head turning design of the 2011 Chrysler 300 to provide the ultimate combination of world-class luxury, power and handling. With an estimated 465 horsepower and 465 lb.-ft. of torque, the 300 SRT8 is targeted at customers that seek heart pounding, adrenaline filled excitement, but don't want to sacrifice comfort and innovative features to get it. The Street and Racing Technology (SRT) performance engineering team builds upon the all-new 2011 Chrysler 300 sedan already executed for a world-class luxury experience, to deliver Chrysler's most powerful and best handling model ever. 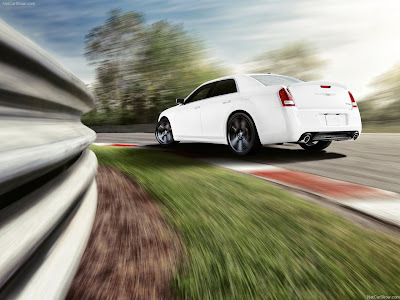 Projected performance numbers include 0-60 mph acceleration in the high 4-second range; quarter mile in high 12 second range; 0-100-0 mph in less than 16 seconds, top speed of 175 mph and stopping power from 60-0 mph in 120 feet. 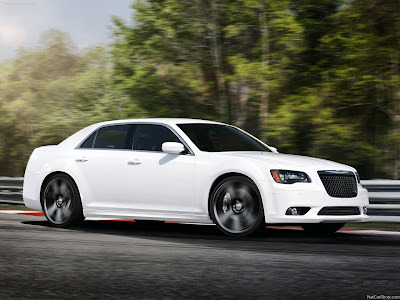 The return of the Chrysler 300 SRT8 to the Chrysler lineup in 2012 evokes a strong comparison to the original high-performance production car of its time - the 1955 Chrysler 300. Known for simple, strong lines, excellent engineering, high levels of luxury and outstanding performance with the first modern American V-8 engine to produce 300 horsepower, the first Chrysler 300 (C-300) was styled by Virgil Exner, who radically redesigned the entire Chrysler line and created what they called "The Forward Look" in 1955. Without much chrome on the sides, his designs were simple, but strong. Exner is credited with creating the illusion of fast, forward movement. The Chrysler C-300 won on both the road course and the "flying mile" at Daytona in 1955. In 1956, the Chrysler 300B model won both events again. In fact, the Chrysler 300s dominated NASCAR competition in 1955 and 1956, taking the overall championship in both years. A legendary and luxurious performance car was born. 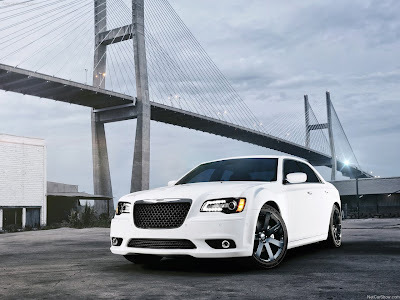 The "letter cars" quickly became the most desirable of the Chrysler lineup and became known as the "Beautiful Brutes." Under the hood of the 2012 Chrysler 300 SRT8, the new 6.4-liter HEMI® V-8 makes its debut in the Chrysler brand product lineup delivering an estimated 465 horsepower and 465 lb.-ft. of torque, up 40 horsepower and 45 lb.-ft. over the 6.1-liter HEMI V-8 it replaces. The improved torque output - including an additional 80 lb.-ft. at 2,900 rpm - allows for inspired standing starts and improved straight-line performance while new, performance-tuned motor mounts improve idle stability and ride control at any speed. An active intake manifold and high-lift camshaft with cam phasing provides maximum low-end torque while optimizing high-end power. 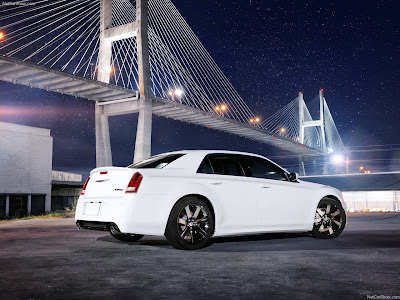 Even with the elevated power numbers, an estimated 25-percent fuel economy increase on the highway is achieved by use of a new for 2012 active valve exhaust system that allows the standard Fuel Saver technology (four-cylinder mode) to engage over a wider rpm range. The new active exhaust system also allows for straight-through mid and rear mufflers for a throaty exhaust note under engine load. Specific fuel economy numbers will be announced closer to the vehicle introduction. Standard steering wheel-mounted paddle shifters join the standard Auto Stick on the floor console. Both are mated to the proven five-speed automatic transmission, allowing a choice of spirited shifting on the road and the race track. Both methods give the driver the ability to manually shift the transmission. The transmission controller calibration in "Auto" mode prevents situations that might over rev the engine; while in "Sport" mode, it allows the driver full control of the shifting schedule. 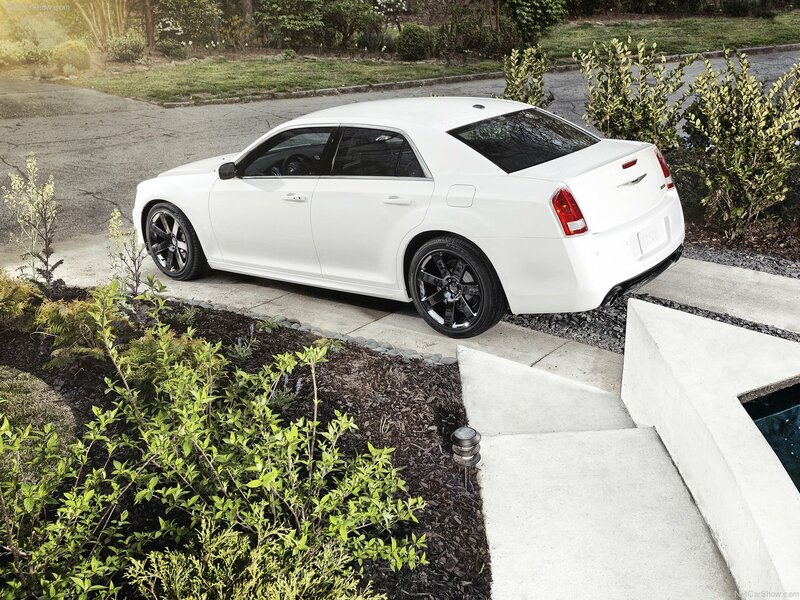 Fully adaptive electronic control of all shifting makes the powertrain more responsive while minimizing harshness. New for 2012 is an Adaptive Damping Suspension (ADS) system that is tuned specifically for the Chrysler 300 SRT8 to offer a compliant and comfortable ride. The ADS system also uses a wide range of on-road and driver inputs - such as vehicle speed, steering angle, steering speed, brake torque, throttle position and lateral and vertical accelerations - to automatically tune the suspension for specific conditions when necessary. In addition, drivers can manually choose between "Auto" and "Sport" settings that quickly change the shock damping and harshness characteristics from everyday commuting to more spirited driving situations. 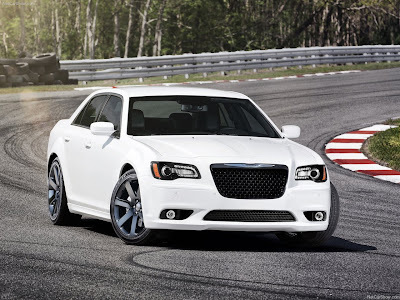 SRT vehicles are well known for their world-class stopping power and the 2012 Chrysler 300 SRT8 features 14.2 inch (front) and 13.8 inch (rear) vented/slotted rotors with four-piston Brembo calipers painted in silver finish. Improved brake cooling and fade performance comes courtesy of new underbody belly pan with integrated brake ducting. The standard Ready Alert Braking system anticipates situations when the driver may initiate an emergency brake stop and engages the electronic stability control pump to set brake pads against rotors in order to decrease the time required for full brake application. 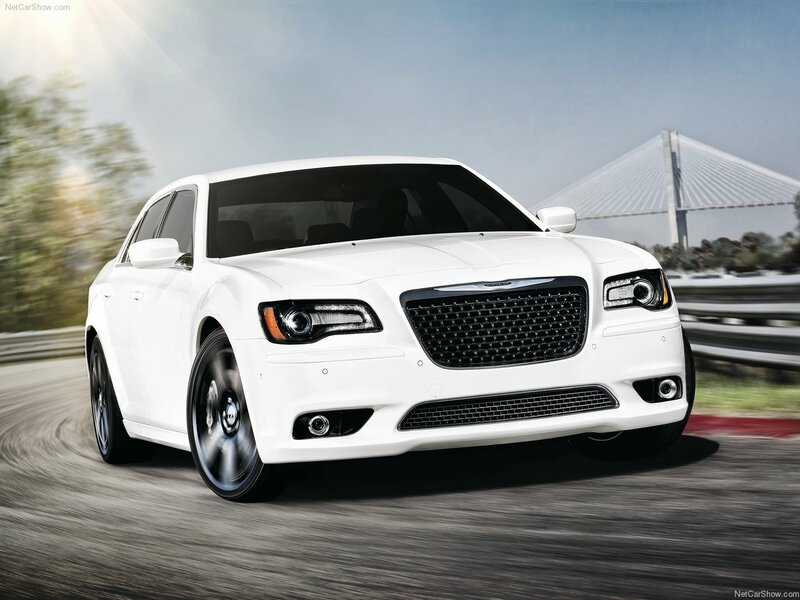 An exclusive new front fascia has a modern, yet timeless appearance that is carried through with the all-new grille and new Chrysler wing badge. The black chrome upper and lower grille surrounds and rear valance strip are part of the available Black Chrome Package. 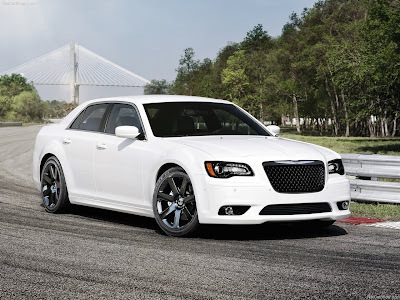 The 2012 Chrysler 300 SRT8 is one-half inch lower when compared to the base car and features new SRT-exclusive side sill cladding painted in matching body color for the "planted" look of a true sports sedan. The rear includes a unique lower fascia with chrome accent bar, new 4-inch round dual exhaust tips and a modified SRT8 decklid badge with new black accent. Rounding out the Black Chrome Package are the black chrome accent spear and exclusive black chrome wheels. An all-new leather-wrapped, heated, SRT-exclusive steering wheel features a unique rim section with a flattened bottom surface showing the SRT logo. Standard paddle shift controls flank both sides of the new contoured palm rests while all audio and Electronic Vehicle Information Center (EVIC) controls are accessible from the horizontal spokes on the steering wheel. The new instrument panel's 8.4-inch color touchscreen display - the segment's largest standard display - also has all the same Performance Pages data as the EVIC, and is further expanded to include steering angle, horsepower, and torque outputs along with engine gauges. The display is customizable to a driver selectable background. An available Premium Leather Interior Package offers Poltrona Frau "Foligno" leather wrapped upper door trim panels, instrument panel, cluster brow and center console side panels. Nappa leather covers the door bolster, armrest and center console armrest. Chrysler brand's signature SafetyTec Group is available on the 2012 Chrysler 300 SRT8 and packages many first-time-available features including adaptive-forward lighting (AFL), high-intensity discharge (HID) projector high and low-beams with automatic headlamp leveling, Forward Collision Warning (FCW) with adaptive-cruise control (ACC), Blind-spot monitoring (BSM) with Rear Cross Path (RCP) detection, ParkSense® front and rear park assist system, LED-illuminated rear fog lamps, exterior mirrors with supplemental turn signals and approach lamp. The state-of-the-art Uconnect® Touch 8.4N system provides all of the next-generation mobile infotainment and multimedia items to keep passengers connected between any destinations. With the segment's largest standard touchscreen display (8.4-inches), the easy-to-use system delivers world-class functionality with an intuitive user interface that was benchmarked against the best E-segment sedans from Europe, Asia and North America.